I've nicked the graphics from there to brighten up this page. Mike Clargo, an aspiring young musician with the band, Middleftout, lent me a demo tape with two songs on it. He told me that he was the drummer for the band, which he said is a Rock band that would like to make music that people can dance to. The first song starts out with a very strong bass influence and then a guitar. Initially it doesn't sound like Rock, but more like House or Garage, but as the song progresses, you can definitely hear Rock overtones combines with a bit of Rap. This synthesis of different musical types is understandable, considering the fact the Middletout is a young band that would in all probability be influenced by current sounds, such as House, Garage and/or Rap. Drumboss does, however, have very prominent Rock influences and the song is quite easy to listen to. In some ways, the lyrics can compete with the work of some of the classic bands from decades past. The second song on the demo tape is WIP. The beginning of the song has a strong keyboard and percussion influence. It begins softly, but the lyrics become stronger as it progresses. It has an unusual, futuristic sound that you must listen to in order to truly understand. Midway into the song, the guitar takes centre stage over the percussion, keyboard and bass. The guitar eventually fades out and the vocals then dominate, which then fade out into a keyboard sequence. Both songs are well worth listening to. They are different, not quite progressive and definitely not classic, but certainly worth experiencing. Although I have not personally seen the band perform, I heard through the grapevine that the lead singer is a very good entertainer. 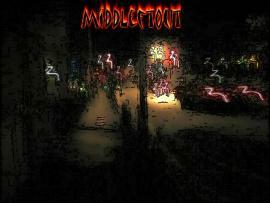 If you would like to hear more about Middleftout, then you can email Mike Clargo at Clegmister@hotmail.com , who I am sure will be quite happy to fill you in about the band. who play Sequencer, Drum machine, Keyboards, Sampler, Guitar, Drums and Vox. This page is Copyright © Doug Anderson 2000 - 2001. Created: 10 June 2001. Last updated: 11 January, 2002.